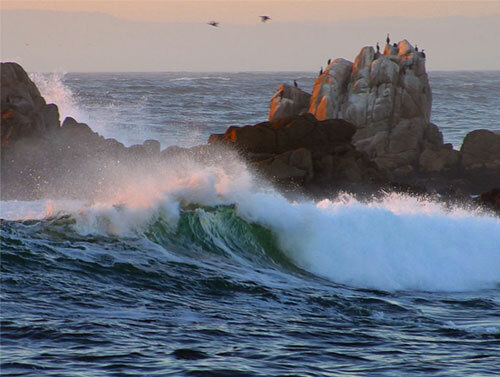 Sea spray forming on rocks off Asilomar Beach, California. Seawater contains high levels of salt and other dissolved substances. Recent studies indicate that salt contained in sea spray droplets may play an important role in atmospheric chemistry. In fact, exposed ions on the ocean surface and in aerosols could potentially bind and react with all sorts of chemicals from the atmosphere. Consequently, fog and ocean spray droplets may be more chemically reactive than previously thought. Indeed, recent atmospheric research indicates that is the case. For example, reports suggest that two ions found in seawater—bromide and chloride—trigger chemical reactions that destroy ozone in the Arctic atmosphere. These destructive but natural events occur after wind and waves deposit the chemicals on polar ice and expose them to sunlight. If the 2004 results hold up, atmospheric chemists who have long ignored the contributions of surface ions when modeling conditions such as air quality will have to rethink their calculations. About 50 NSF-supported investigators are currently exploring the fundamental properties of water. Understanding the chemistry of water in its many forms is still considered a major scientific challenge. However, if the remarkable progress of new research is any indicator, this challenge will be met.